I have another confession to make, I am seriously jealous of the historian of the future. Not only will they not have to live through the Tea Party Revolution, they will also have the opportunity to critique the digitalization of music with an impartiality that I could never have. The legality debate, which is now spanning decades, opened a new chapter last week, with the merger of Universal Music Group (UMG) and EMI record labels. 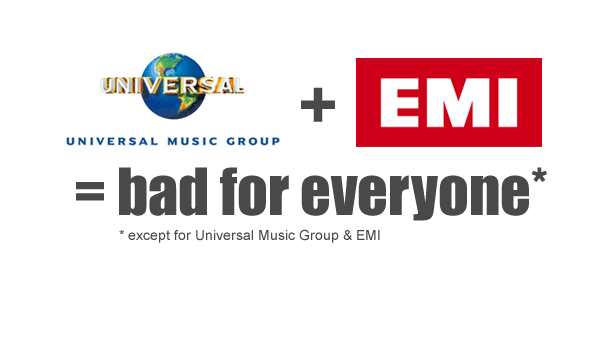 When you combine the powers of UMG and EMI, they account for nearly forty percent of the market. 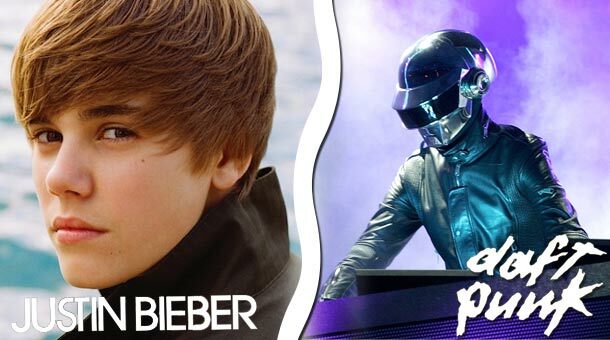 In the fictional world of musical democracy, that would be an uncontestable win. In blogosphere, it would be tagged under juggernaut. As for the real world, it is unlikely that this will bode well for music fans and independent musicians. Let me break this down for you. Not only are Taylor Swift, Will.I.Am, Mumford & Sons, Justin Bieber, the Killers, and Rihanna now on the same label as David Bowie, Daft Punk, Gorillaz, Hot Chip, LCD Soundsystem, the Smiths, Röyksopp, and Talking Heads, but the newly formed UMG-EMI group now stands to be a formidable force when it comes to the handling of music sales. Hypothetically speaking, lets say that UMG-EMI goes into 2013 with forty percent market control. Independent labels will make up a mere ten percent, and for argument sake, Sony and WMG split the remaining fifty percent equally. If we were to take the top ten singles according to iTunes for September 24th 2012, EVERY SINGLE ONE was released by one of the four major record labels or a label owned by them. Even worse, seven of the top ten singles were released by UMG-EMI. Now say you are running a startup company resembling Spotify, Pandora, or even iTunes in its infancy. To be competitive, you will have to secure the rights to music that people are actually listening to. Musical tastes aside, if you have any desire to be a profitable business, you will be catering to the major labels. No, scratch that, you will be bending over backwards for UMG-EMI. All credit may be given to the Federal Trade Commission. If all of this sounds like quixotic economics rant, my apologies. But chances are if you are still reading this, you are probably doing so while streaming music online or listening to a $0.99 single purchased on iTunes. Please pause and enjoy the moment. Because Spotify, Pandora, iTunes will now be answering to the whims and wishes of UMG-EMI and that could mean the end of affordable music apps and digital downloads. Here’s to hoping the economy turns around and a rebirthing of FM radio, as your music dependency could get real expensive in the very near future. As for the world of independent music, the outcome appears to be even more dismal. In a recent NPR interview, Chris Taylor of Grizzly Bear commented on how royalties from online music sales are so watered down by the time they reach the hands of musicians, the real beneficiaries are the music streaming companies and the major labels. That capitalization on the work of artists is only going to increase under this newly monopolized market. If you would like a visualization for that horrid fact, I think this one, albeit being two years old, summarizes it quite accurately. Otherwise, the Oatmeal nailed it with this more comical interpretation. So where does that leave us? Well, lets go back to my opening confession. I am not about to advocate following me down the path of criminal behavior, especially considering that not all of you are privileged to living beyond the jurisdiction of United States copyright laws. Instead I would like to pose an alternative approach, while adding a caveat to my previous statement. Yes, I do download albums illegally. However, I can also say that I paid for physical, tangible copies of four of the last six albums I reviewed. The other two were deleted after I finished the reviews. I am in full support of previewing an album, in its entirety–I like to equate it to test driving a new car or trying on a pair of pants before you buy them. Yet, I do not think that it is unreasonable to ask that we show the musicians that we love a little respect by buying their sound-track-to-your-summer or post-break-up-savior album. Think of it as a symbiotic relationship between you and the musician. While you are nursing that relationship, do it a favor and cut out the middleman. It costs you the same to download an album from bandcamp, the artist’s personal website, or from iTunes, but the latter is shaving a larger personal profit off the top. The future of indie music will thank you, although UMG-EMI probably will not.